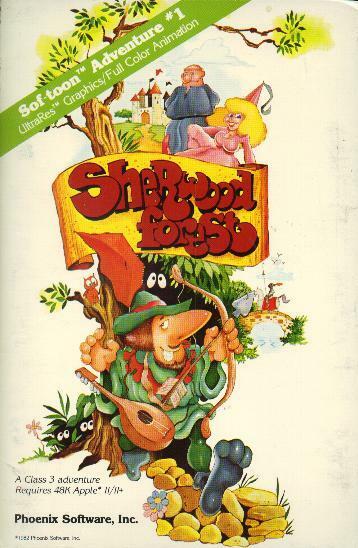 A pretty standard hi-res adventure game featuring characters from the Robin Hood legend. Cartoonish graphics, with a little animation that was kind of neat for the time. Puzzle-based, no real plot. Comes in a paperboard folder like a lot of early Apple II releases. The cover calls it "Sof-Toon Adventure #1", and as far as I know it's the only one of its kind. Eventually Phoenix was bought out and renamed American Eagle (thanks, Paul! ), and I've heard that some of their games were released by both companies, but probably not this one.